Introduction - In a previous article, Far Hills, We Have a Problem, it was argued the United States Golf Association (USGA) Handicap System does not accurately measure a golfer’s potential when scores are below the Course Rating. Under the Handicap System, a player who scores 5 strokes under the Course Rating at a course with a low Slope Rating is considered a better player than one who scores 5 strokes under the Course Rating at a course with a high slope Rating. The USGA has attempted to defend this result in articles and statements by handicap officials. The second section of this paper examines that defense to judge its validity. The arguments made by the USGA are found to have no theoretical or empirical foundation. The third section examines the historical roots of the Slope Handicap System to see how the flaw came into being. It is found that institutional rigidity (i.e., an unrealistic view of its own fallibility), and secrecy played a large part in keeping this flaw as part of the Slope handicap System for over twenty years. The final section proposes a revised Slope Handicap System to correct the shortcoming in the present system. If the USGA Course Rating System was changed such that Course Ratings were all ten strokes less…there would be no Plus Handicaps. Close inspection shows that the adjustment of these Handicaps would produce the same relative changes between higher- and lower- Handicap players as when their handicaps were on the opposite side of scratch. This assertion is demonstrably false which can be proven by an example. Assume Player A scores 5 strokes under the course rating on a course with a Slope Rating of 150. His handicap differential (HD) is -3.8. Player B scores 5 strokes under the Course Rating on a course with Slope Rating of 87. Player B’s HD is -6.5. Under the USGA handicap system, Player B is deemed to be the much better player. Now assume the article’s suggestion is adopted and the course ratings are reduced by 10 strokes. Players A and B now score 5 strokes over the Course Rating at their respective courses. Since Player A played on a course with a higher Slope Rating than Player B, Player A would be deemed the better player. Therefore, there has been a relative change in the assessment of each player’s ability contrary to the USGA’s assertion. To some, it is instinctive that the Handicap Differential should be an even lower value (farther from zero) because it was scored on a high-Slope course. A high–Slope course presents the challenges (and opportunities) for outstanding players to distance themselves from a Scratch performance and, conversely, a low-Slope course does not present the same challenges (or opportunities). …it is much easier to score five below the Course Rating from a set of tees where the scores tend to spread out (i.e., courses with high Slope Ratings). It is much more difficult to break away from the pack by scoring five below the Course Rating from a set of tees where the scores tend to squeeze together. As Slope Rating is a relative measurement of difficulty (not absolute), essentially an indication of how scores are spread out…a performance of 5 under the Course Rating on a Slope Rating of 87 is more significant. On a course with an 87 Slope Rating, scores are expected to spread out at a rate of .77 (87/113…rounded) per difference of 1.0 in the Handicap Index. To beat a scratch golfer (who is a very good player) by 5 strokes on a course where scores are very tight for players of all handicap levels, is more difficult than doing it on a course with a 150 Slope Rating, which spreads out scores by 1.32 per 1.0 in the Index. 1. The USGA argues it is easier to score 5-under the Course Rating at a high-Slope course because challenges allow the better player to separate himself. A tough course may make it easier to identify the truly great player—after all, that is the theory behind the course set-up at the U.S. Open. It does not mean a score of 5-under the Course rating at the U.S. Open is relatively easy to achieve. 2. Assume you are a 3.7 index from a course with a Slope Rating of 87 (i.e., your ten best scores average 3 strokes under the Course Rating and your home course handicap is +3). You now travel to a course with a Slope Rating of 150. You are made a +5 handicap because of the “challenges” presented by this course and its high Slope Rating. You argue that if there are increased challenges at a course with a high Slope Rating, shouldn’t my handicap be increased rather than decreased? Isn’t that what the Slope system is all about? The tournament committee consults the USGA and rejects your plea. 3. Hovde argues the Slope System spreads out scores. This is incorrect. The Slope System multiplies a player’s index by Slope Rating/113 to estimate his score relative to the course rating. If the Slope Rating is over 113, this mathematical operation gives the illusion of “spreading out scores.” What is forgotten is the Slope System also contracts a player’s score by 113/Slope Rating to calculate a player’s index. If a player only plays his home course, for example, the estimate of his score would not be affected by the Slope Rating. 4. Hovde and Cowan both argue scores are very tight at a course with a low Slope Rating. Like most of Slope Theory, their argument is based on supposition and has not been empirically verified. There is no research indicating the standard deviation of the distribution of a player’s scores is a function of the Slope Rating. 5. Now here is a reality check. Assume you have Player A consistently scoring 4-under the course rating at Pine Valley (Slope Rating = 155). Player B scores 4-under the course rating at The Oasis (Slope Rating = 87). In a match at Pine Valley, Player A would receive 3 strokes from Player B. The USGA Handicap System implies the match would be even. Who would you bet on? Tracing the Historical Roots of the Slope Handicap System - Before detailing the proposed Slope System, it is important to understand the historical roots of the present system. The figure below illustrates the problems the System was designed to cure. A 10-handicap (pre-Slope System) from Perfect Valley allegedly would score several strokes higher at Panther Mountain because of various course difficulties—i.e., a 10-handicap from Perfect Valley could not fairly compete with a 10-handicap from Panther Mountain. The argument has intuitive appeal even though it has not been empirically verified. None of the papers proposing the Slope System, however, discuss the region below the Course Rating (i.e., plus indices). The USGA merely extrapolated the slope line based on two points (the scratch player’s score and the bogey player’s score). When the slope line was in the region below the Course Rating, it had to be assumed that the plus handicap player from Perfect Valley was a better player than a Panther Mountain player with the same plus handicap. This meant the Perfect Valley player with a plus handicap would have his handicap reduced when he travelled to Panther Mountain. There is no empirical or theoretical evidence to support this reduction. It is simply the result of assuming the slope line continues as a linear function in the region below the Course Rating. A revised Slope System should have a more realistic assumption of what occurs in this region. This flaw in the Slope Handicap System has minimal effect on the equity of competition. After all, there are not that many players with plus indices. Why then has the USGA made a spirited defense of its error? The reason appears to be twofold. First, the Slope Handicap System is a USGA product and to admit a manufacturing defect would hurt the brand image. Whether it is the handicap system, equipment testing, or rules changes, the USGA is loathe to admitting fallibility. This is especially true in the handicapping area where for many years external criticism was handled directly by those who developed the Slope System. Second, the USGA conducts what little research it does on handicapping without peer review. This has made the USGA a very insular organization. The Handicap Procedures Committee apparently has no members who can challenge the Handicap Research Team (HRT). This allowed the HRT to publish the gobbledygook contained in “Slope on the Plus Side of Scratch” and have it be accepted by leading officials at the USGA and at state golf associations. A Proposed Slope Handicap System – In the region above the Course Rating, the slope effect in the current Slope System is positive and decreases in size as the handicap of the Perfect Valley player decreases. At scratch, there is no adjustment. 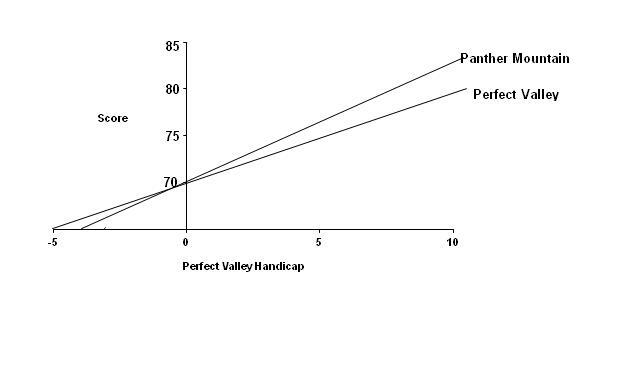 In the region of plus handicaps, the slope effect is negative and increases in size as the Perfect Valley player’s handicap decreases (i.e., a +5 handicap at Perfect Valley will have a larger handicap reduction than a +2 handicap when they play at Panther Mountain). Is this reasonable? Why should a reduction in handicap for a plus handicap be based on the travails of a bogey golfer? Isn’t it possible Panther Mountain has course difficulties the plus handicap from Perfect Valley rarely encounters? Shouldn’t the plus handicap from Perfect Valley have his handicap increased, rather than decreased, when he travels to Panther Mountain? Index <0, then Handicap = Index rounded to the nearest integer. Index >0, then Handicap = Index x Slope Rating/113 rounded to the nearest integer. A player who consistently scores 3 strokes under the course rating would be a +3.0 index (forgetting the bonus for excellence) and a +3-handicap at all courses. This eliminates the paradox of the player from the course with the low Slope Rating being considered the better player when both players score the same number of strokes below the Course Rating. This change will make a small difference for players with scores below the Course Rating in intra-club play. Table 1 below shows the handicap differentials for various scores and Slope Ratings. As a general rule, if a player has scores below the Course Rating in his ten best scores, his index will be reduced under the revised system if the Slope Rating is greater than 113. His index will be increased under the revised system if the Slope Rating is less than 113. In this example, however, both players would all play to a scratch handicap under both the old and revised system. To see that the proposed system is equitable, Table 3 shows the difference in handicaps, regardless of the Slope Rating, for players with the same difference in scores. The major difference under the revised System is when a plus index travels to another course. Let’s see how competition between Panther Mountain and Perfect Valley players would be affected by the proposed system. Assume the Panther Mountain Players scores 10 strokes over the Course Rating and the Slope Rating is 150. Further assume the Perfect Valley player scores 5 strokes under the Course Rating and the Slope Rating is 113. Table 4 shows the difference in handicaps when matches are played at the two courses. As shown by the table, handicap differences generated by the two systems are the same except when a plus index player travels to another course. If a player with a non-plus handicap travels to another course, both systems yield the same handicap difference. The question is “Which system is more equitable?” The current system assumes a plus index from Perfect Valley will score lower–relative to the course rating—at Panther Mountain than he does at his home course. This seems implausible. The proposed system appears on its face to be more equitable. Like all proposals, however, it faces two tests. First, can the increased accuracy of the revised system in measuring the ability of players scoring below the Course Rating be empirically verified? Second, even if the answer to the first question is “yes,” is a change worth the effort? The revised system may only increase the equity of competition for a few players, and it is not without cost. Until these two questions are answered, however, it is clear the USGA should remove its defense of the Slope System, Slope on the Plus side of Scratch, from its website. Far Hills, We have a Problem, ongolfhandicaps.blogspot.com, June 4, 2012. The USGA may be arguing if there is a difference in index between players, the difference in calculated handicaps is not affected if either or both players are a plus index. This is true and never in question. The issue is whether the Slope Handicap System accurately measures the ability of players with scores below the Course Rating. Cowan, Jim, e-mail to the author, 4/13/2012. Cowan appears to argue there is a force proportional to 1/(Slope Rating) that constrains scores around the Course Rating (i.e., a score of 5 under the Course Rating at a course with a high Slope Rating is relatively easy to achieve because the force is relatively weak). Extending Cowan’s logic, a score of 5-over the Course Rating should be easier to achieve on a course with High Slope Rating than on one with a low Slope Rating. Such a finding would conflict with Slope Theory that holds it is easier to score 5 over the Course Rating on the course with the lower Slope Rating. Hovde, Scott, e-mail to author, 4/16/2012. It actually estimates the average of his ten best scores out of twenty multiplied by .96. Sheid argued the standard deviation of a player’s scores increased with his handicap, but was mute on any effect of the Slope Rating. See Scheid, F.J., “On the normality and independence of golf scores, with various applications,” in Science and Golf: The Proceedings of the First World Scientific Congress, Rutledge, Chapman, and Hall, London, 1990, pp. 147-152. Stroud, R.C., and L.J. Riccio, “Mathematical Underpinnings of the Slope Handicap System,” in Science and Golf: The Proceedings of the First World Scientific Congress, Rutledge, Chapman, and Hall, London, 1990, pp. 135-146. Stroud and Riccio did not extend the slope lines below the course rating in their paper. Stroud, loc. cit. and Knuth, D., “A two parameter golf course rating system,” Science and Golf: the Proceedings of the First World Scientific Congress, Rutledge, Chapman, and Hall, London, 1990, pp 141-146. It is probable that the USGA adopted the linear assumption because it was simple, and made the computations from index to course handicap analytically simple. Simplicity, however, is not a sufficient selection criterion. The primary objective was to increase the equity of competition. If any slope effect is not linear, then the Slope System has only distorted true handicaps and lessened equity as the case of the plus index suggests.